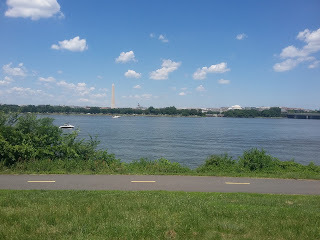 It's a beautiful June day: the sun is shining, the humidity and temperature are low, and there's nothing to hold me back from a nice bike ride along the Potomac. 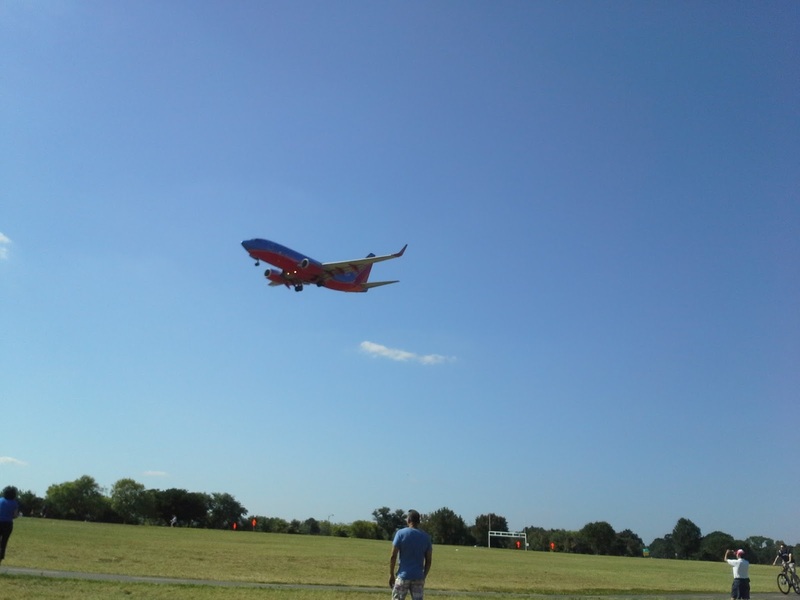 If you don't know, the DC area is pretty bike-friendly. I live near the Custis Trail, which runs through Arlington, passes by the Key Bridge (into Georgetown in DC), then continues south along the river, past Memorial Bridge and Arlington Cemetery, and continuing on to Mount Vernon. 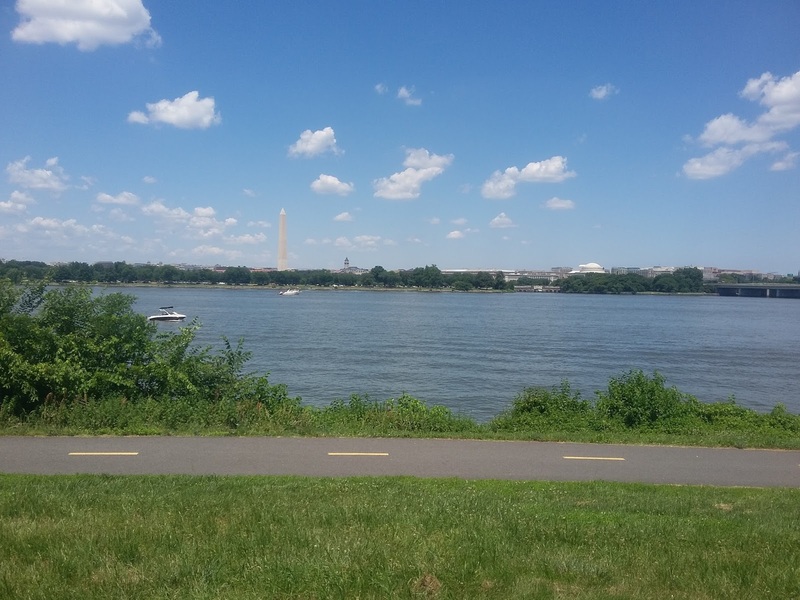 I don't do it often, but I've been known to bike the 4.5 miles from home, down the Custis Trail, across Memorial Bridge, and around the Lincoln Memorial to work. Today was less ambitious. I drove (avec bike) to the marina near the Navy-Merchant Marine Memorial. 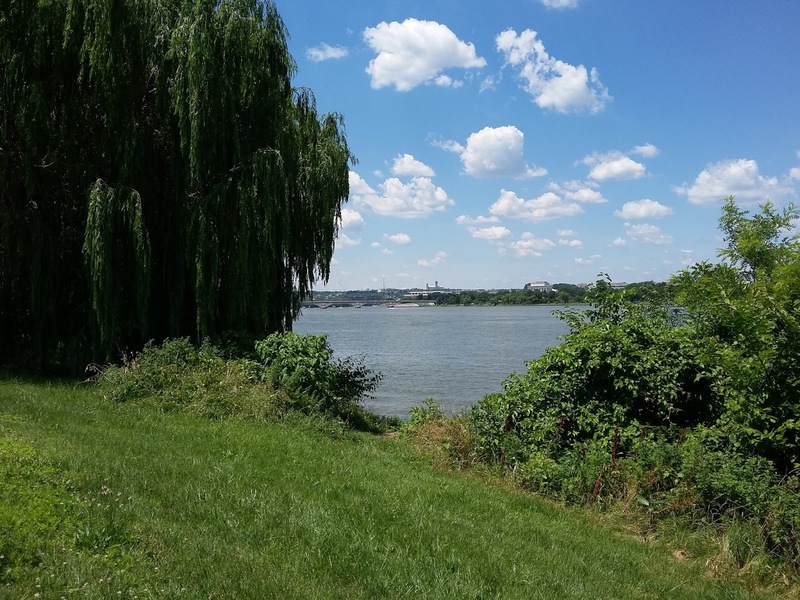 I hopped on my bike, went underneath the George Washington Parkway, came up, rode along beside the GW Parkway, and then went up onto the 14th Street Bridge. Now, the 14th Street Bridge across the Potomac is actually a complex of bridges. There is the double-span bridge carrying cars across on I-395, there's a span carrying US Route 1, and there's a Metro and a railroad bridge, too. What a lot of people (consistently) forget is that DC really does have a long history. The site of the 14th Street Bridge today was the approximate site of the Long Bridge in the 19th century. 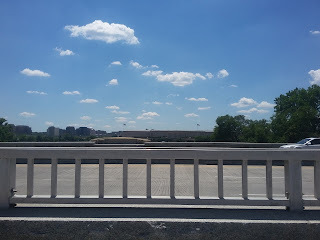 That bridge was, well, a long bridge--about a mile long, linking Alexandria to Washington City. You had to pay a toll to get across, and during the war it was heavily guarded, as were the other bridges (further up the river, there was the Aqueduct Bridge near present day Key Bridge and the Chain Bridge, on the same site as today's Chain Bridge). Memorial Bridge, Roosevelt Bridge, and the two Beltway Bridges (the American Legion and Wilson Bridges) wouldn't exist for a long time. After crossing the bridge, I passed by the George Mason Memorial. Poor Mason; his memorial was looking a little shabby today. I think they're doing some work. Most people who don't go to George Mason University aren't familiar with Mason, who was a Patriot from Virginia who was not a big fan of the Constitution when it was first written. 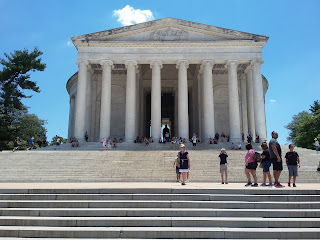 In any case, just beyond that is the Jefferson Memorial. You know: the round, white, neo-classical temple right on the Tidal Basin, with a large black statue of Thomas Jefferson inside. It gets a lot exposure in cherry blossom photos, because it's absolutely stunning when the blossoms are at their peak. Today, the Memorial was swarming with visitors. There's a broad plaza out front looking down to the water, and all along the Tidal Basin are pleasant, shady spots to spend a sunny June afternoon. There was a huge group of bikers in bow-ties, bowler hats, and pretty summer dresses--a wedding party, perhaps. A lot of paddle-boaters were out on the water, soaking up the sun. A hundred and fifty years ago, of course, none of this was there. I don't just mean the Memorial wasn't there. That seems fairly obvious; it was built in the '30's. No, what I mean is that there wasn't even land there. 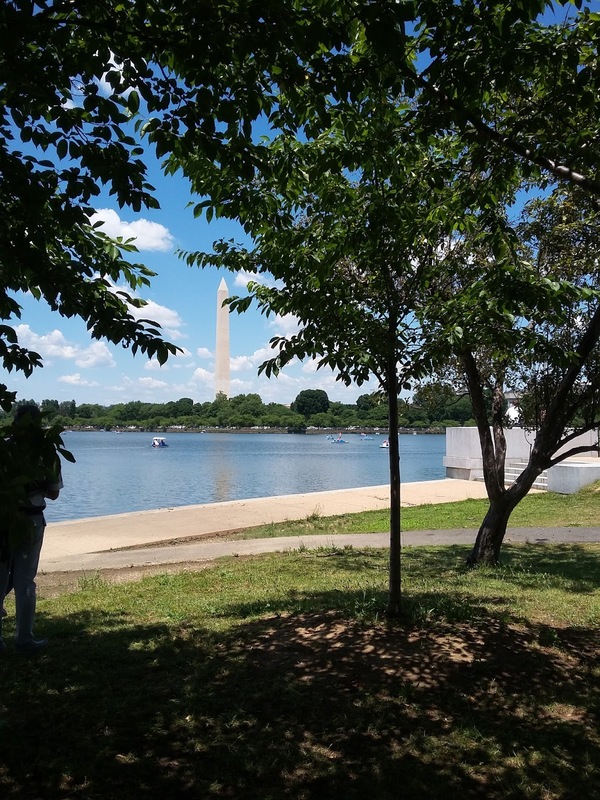 This area, and the area north of it where the MLK Memorial and Lincoln Memorial now stand, was a tidal flat. In fact, the water went all the way up to the front yard of the White House, to what is now Constitution Avenue. Where the National Mall is now, there was a poorly drained creek called Tiber Creek. It wasn't until the late 19th century that the land was reclaimed. One little reminder of that is the old Lockkeeper's House on Constitution Ave. and 17th St. There was a canal there once upon a time, complete with locks, but now it's just landlocked (pun intended). 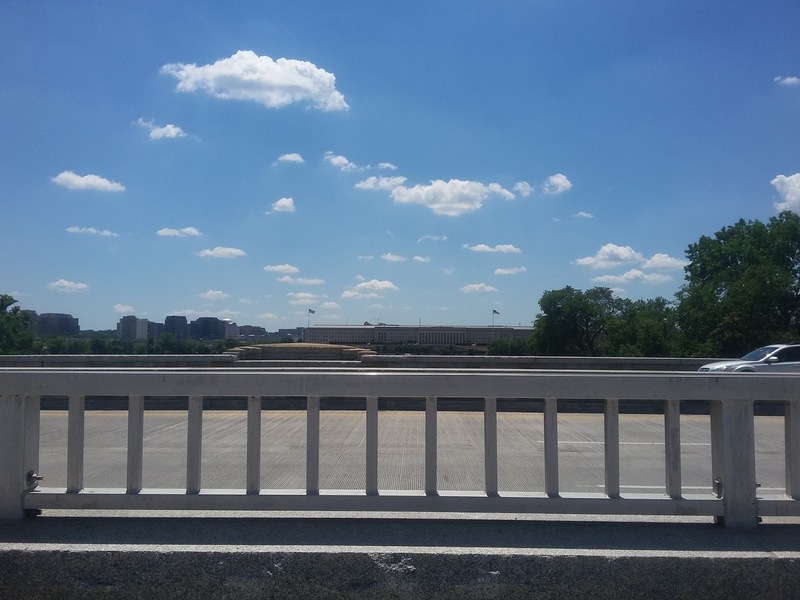 On my way back, I paused to look west and took a picture of the Pentagon (see below). Built during World War Two, it's a low-slung, unassuming building. I drove past it on the highway many times before realizing what it was. There's history all over DC--about 225 years' worth of being the capital city, and an even longer history for Georgetown and nearby Alexandria. You just have to look. It's important to look around and recognize what a beautiful city this is, but also to recall how much it's changed along with this country. 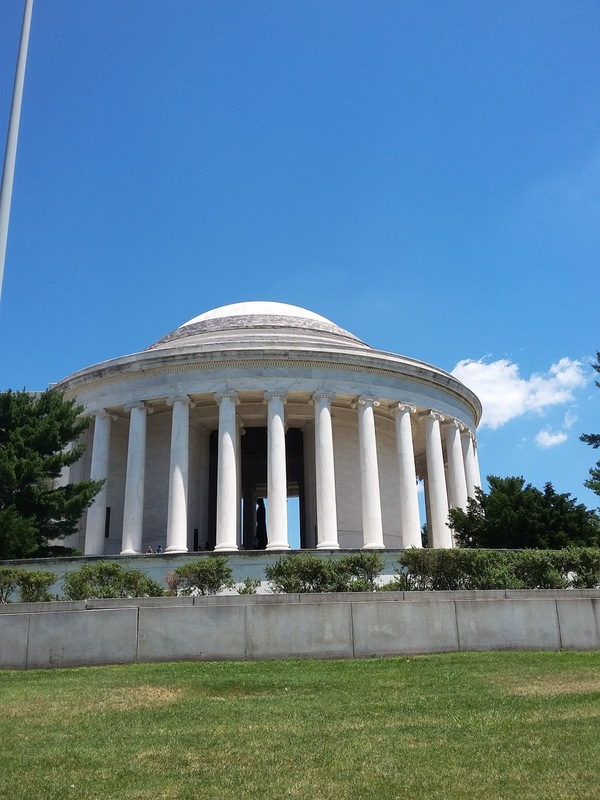 And it's absolutely worth the time to take a bike ride around the area and look not just at the monuments but at how they got to be there. It's hard to tell, but that's the Pentagon.